Mr Favorit is a Malta- and UK-licensed online casino that was launched in January of 2019. The casino targets the Nordic regions in Europe, the United Kingdom, as well as attempting to break into the lucrative market of Canada. This Mr Favorit review will run you through everything you need to know about this online casino. The casino boasts a large selection of slots, RNG table games and a full complement of titles by outstanding live dealer provider Evolution Gaming. Top this off with a nice selection of scratch cards and some unique real money titles such as Solitaire and keno and you should find everything you could possibly want. Mr Favorit also has some great promotions, including an enticing sign-up offer, and an Exclusive Club which aims to keep the punters coming back. To open a new account at Mr Favorit and take advantage of some great promotions it’s as simple as visiting https://www.mrfavorit.com/ and following the prompts. Read about verifying your account below before moving forward because there are some important things to note. 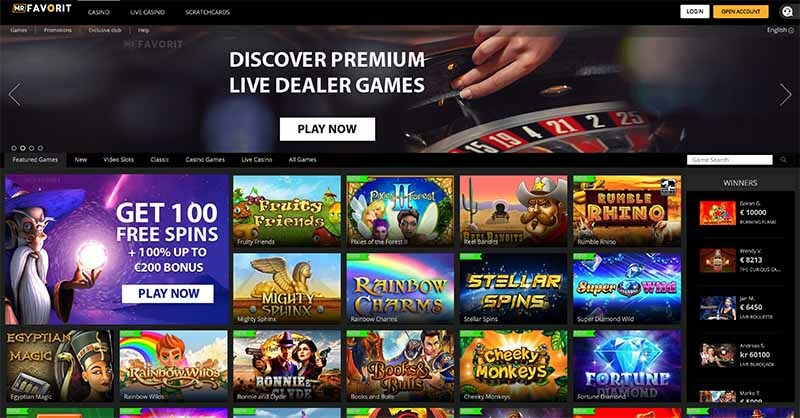 Mr Favorit Casino is owned by Favbet Online S.r.l, a Romanian incorporated company, and came online in December of 2018, before officially launching on January 1, 2019. The casino is powered by Aspire Global International, which is a well known i-gaming platform based out of Malta. Aspire handles everything from the required licences a casino needs to operate, right through to the technical aspect of hosting games and customer service. MrFavorit.com has a great sign-up offer for new players: a 100% bonus up to the value of 200£/€/$, while you will also receive 100 free spins over your first three deposits. 2nd deposit: Make a deposit of 20£/€/$ or more on your second day playing at the casino and receive 40 free spins. 3rd deposit: Receive 40 free spins when you make a deposit of 20£/€/$ or more. 35x turnover requirement on both matched deposit and any free spins winnings. Free games must be used within one day of being credited to your account. While there are some restrictions on claiming these features of the VIP program, such as needing to have deposited within 14 days to claim your Free Play Sunday promo, MrFavorit.com’s unique program is definitely worth keeping an eye on if you are a regular playing at online casinos. It’s one of those things that will really benefit repeat players. The Mr Favorit website is fully responsive which means you can play on any mobile device you might have. Basically it’s the same process as on desktop – you visit MrFavorit.com and open a new account to get started. It is true that not every software provider makes their games on mobile, but many are now building mobile-first, which means fewer and fewer games are unavailable on mobile. One of the highlights of the mobile offering is that some great Evolution Gaming live dealer titles are available. Other cool features of the casino, such as the various ongoing promotions, the suite of banking options and the VIP program, are also open to mobile players. Mr Favorit has its payments processed by Aspire, which handles most of its back-end stuff. This is not a negative. In fact, using a third party to process payments is pretty standard in the industry and Aspire is right among the best of them. The deposit options you will find at Mr Favorit are dependent on where you are in the world, with not every payment type available in every country. Withdrawals at Mr Favorit take about industry standard to be processed with money hitting your account between 3-8 days after your cash-out request with the time depending on your method. Unlike some other online casinos, there are heaps of methods to withdraw. You will be able to do a bank transfer, use a web wallet such as Neteller or Skrill or even move your winnings back to the card you deposited with, depending on the type of card you hold. When you open a new account at MrFavorit.com you will be required to verify your email address as a starting point of the verification process. It’s important that you use your correct details when signing up at the casino because if you don’t you may find yourself in a situation where you can’t withdraw because you can’t verify your details. To verify your account you will need some photo identification (passport or driver’s licence) and potentially some other documents like a utilities bill. You upload these documents in your account section. Mr Favorit Casino has several different licences, which means it has to abide by some high standards, including meeting the UK and Malta guidelines, two of the most stringent online casino licensing bodies in the world. While the casino does not hold these licences directly, they are a White Label of Aspire, which means they are allowed to piggy-back off their licensing. The licences they have include the United Kingdom Gambling Commission, Malta Gaming Authority and the Alderney Gambling Control Commission. After reading our Mr Favorit review you would be aware it is a new online casino to the scene in 2019, which means there are limited online opinions about how players are treated. We’d love to hear your feedback in the box below or join the casino.